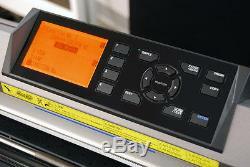 24 Graphtec CE6000-60 Vinyl Cutter Plotter w/ Stand & BONUS 12-roll Vinyl Pack. 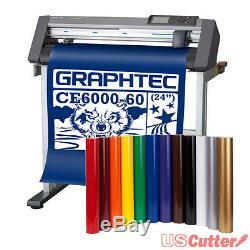 Graphtec CE6000-60 24 Cutter Plotter Bundle. 1x 24 Graphtec CE6000 Cutter Plotter. 1x Cutting Master Software Plug-in. 1x Graphtec's ARMS (advanced Registration Mark Sensor) System. Graphtec CE6000 Series Vinyl Cutter. The new Graphtec CE6000 offers outstanding and professional performance at a reasonable cost and moves the cutting capabilities of the CE series nearer to those of Graphtec GB's flagship FC8000 series but without the need for a huge additional investment. The CE6000 series delivers a maximum cutting force of 300 grams and an improved maximum speed of 35.4 inches per second (in all directions). The built-in front control panel provides complete parameter control including eight preset cutting conditions, as well as advanced features like tangential control mode, down force offset, pen up speed, blade wear monitoring and more. With a 25 pin RS-232C or the High Speed USB 2.0 control interface, the CE6000 is compatible with legacy computer systems as well as the latest PCs available now and for several years to come. With a newer, larger LCD screen, managing your cutting jobs is simpler than ever! Our most popular package of vinyl. GreenStar IPV vinyl is part of an exciting new line of products available from USCutter! GreenStar Intermediate Performance Vinyl (IPV) is a 5-year, calendered vinyl, custom formulated for basic sign use. This sample pack of twelve 24, 5-yard rolls is just what you need to get started. 35.4"x23.3"x41.2 (900x593x1046mm). Self-adhesive vinyl film, light reflective film (except high-luminosity), Amberlith, Rubylith, etching resist, pain masking film, rhinestone pattern media, heat transfer vinyls: flex, flock, images transfer media, vinyl print media, cardstock up to 10pt (220g/m²). 66 lbs (30kg) with Stand. We start more auctions at 1 cent because we are confident that we can always offer the best price. We get the best pricing; you get the best value. Other's claim to be top sellers, but look at their feedback and see the truth! Community - We have a huge online forum where you can learn more and see how we are committed to improving our reputation through outstanding service and support. Software Choice - Most of our machines come with a SignBlazer Elements Trial Edition. The software is outstanding software that is easier to use and more capable than Flexi Starter. Reputation - We don't inflate our specifications. We just sell the best product for the lowest price. You have 30 days from the time you receive a product to initiate a return or to report a defective product. See the items below to determine the terms for your return. Any order placed with USCutter implies consent to abide by these policies. Full support will be given by USCutter representatives in the replacement of any parts sent. Any equipment older than 30 days may be replaced with a certified refurbished unit at our discretion. If an item arrives in an unusable condition, USCutter must be notified within 30 days of receiving the product or a return may not be allowed. Consumable Material: Vinyl, transfer tape, and other supplies are not eligible for return once the packaging is opened. Software: Software is not eligible for return under any circumstances. If the disc is determined to be defective a digital download for the item may be supplied at the discretion of USCutter. Local pickups are not available. We do sell products internationally and do our best to minimize problems but it is impossible to eliminate all potential issues and delays. National holidays do not count towards expected time of transit and should be calculated as an additional day of transit. The item "24 Graphtec CE6000-60 Vinyl Cutter Plotter with Stand & BONUS 12-roll Vinyl Pack" is in sale since Friday, July 19, 2013. This item is in the category "Business & Industrial\Printing & Graphic Arts\Plotters, Wide Format Printing\Cutters- Wide Format". The seller is "uscutter" and is located in Redmond, WA.